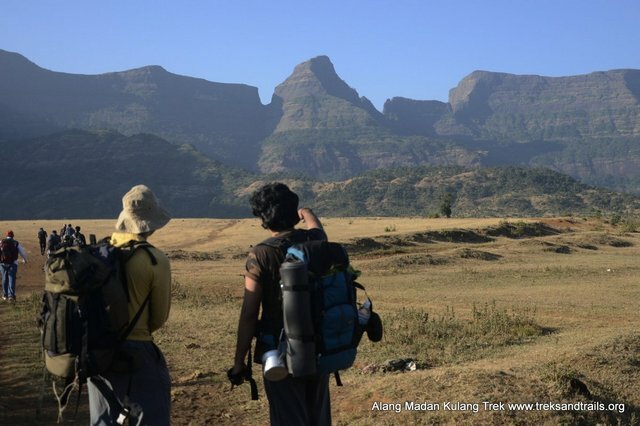 To reach Ambewadi base village for Alang Madan Fort Trek, board Kasara Local Train and then hire local jeep by the Igatpuri Kasara Ghoti Pimpalnermor route. There is a bus service from Ghoti to Ambewadi. Ambewadi is 32 km away from Ghoti. A bus is available at 6 a.m. from Ghoti to Ambewadi. We can easily see Alang, Madan, and Kulang from there. Alang Fort also known as 'Alangad' is a fort in Nashik district, Maharashtra, India. It is one of the three forts, the others being Madan and Kulang, in the Kalsubai range of the Western Ghats. They are the most difficult to reach in Nashik District. A dense forest cover makes these treks difficult. These three forts are a little neglected due to very heavy rains in the area and a difficult confusing path to the fort.Being in the same region of the three forts it is said that climb to Kulang is the most difficult. On the way up to climbing, we come across patches of rock cut steps. It takes 6 hours to reach from Kulangwadi to the fort. On the fort to see around there are 5 water cisterns. From top we could also see Mahuli with the 3 pinnacles. One can also stay at the caves here. The climb preferred is usually between Madan and Alang. The time taken could around 3 to 4 hours to reach the step after leaving Kulang fort. over here rock climbing would be required as the wall of the steps was destroyed during the cannon fire. Use of a fixed rope is required. There is one large cave on this fort and 2 water cistern. The top of the fort is a huge plateau. On the fort, there are two caves, a small temple, and 11 water cisterns. Remnants of buildings are spread over the fort. Kalsubai, Aundh Fort, Patta, and Bitangad are to the east of the fort, Harihar, Trymbakgad and Anjaneri to its north and Harishchandragadh, Ajobagad, Khutta (pinnacle), Ratangad and Katrabai to its south.